Successfully Added USB HDD Docking Station with Clone Function to your Shopping Cart. USB HDD Docking Station with Clone Function. Copy or move your files between two hard disks without a PC. Can you imagine it? 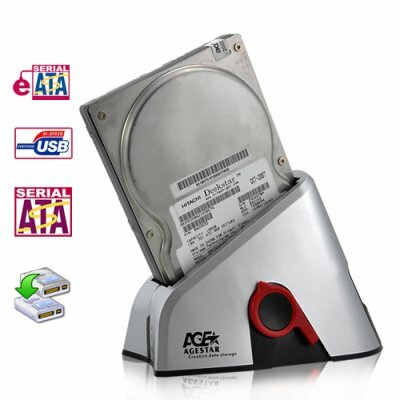 With this USB HDD Docking Station, you just need to insert one hard drive to your docking station and the other one connected with a SATA cable, and by just pressing the backup button, you can instantly transfer files between the two hard disk drives without the need for a computer or laptop! When the function light stops flashing, you’re done! Your HDD has been cloned! But wait, there's more --- consider it a bonus gift. This amazing device also comes with an eSATA PC Adapter. The benefit to you? Instant eSATA interface so that you can transfer data between eSATA devices at speeds 5x faster than USB! This superb super convenient Clone Docking Station is in stock now and available at a factory direct wholesale price directly from Chinavasion. Click "Add to Cart" now, and in a few days you'll have your very own USB HDD Docking Station! If my computer has an eSATA interface, can I use it to transfer data? Yes, of course. eSATA transfer speeds are 5 times faster than USB. You can also use the eSATA cable which comes in the package. Having said that, if your computer does not have an eSATA interface, no worries --- this product also comes with an eSATA PC adapter.